Have two of these tasty fruit scones as a snack. 1. Soak the oats in a little of the milk for 5 minutes. Mix together the flour and baking powder. In a jug, beat together the eggs and remaining milk. Make a well in the flour, pour in the liquid and beat together until smooth. Stir in the oat mixture and dried blueberries. 2. Spritz a large non-stick frying pan or flat griddle with oil. Drop small spoonfuls of the batter in the pan and cook for 1-2 minutes on each side until risen and golden brown. 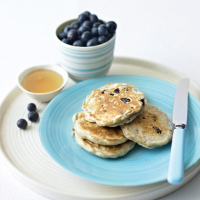 Serve warm with fresh blueberries and a tiny drizzle of honey. Any leftovers, once cooled, can be stored in an airtight container and toasted to reheat. This recipe was first published in Thu Jan 19 14:11:00 GMT 2012.